I normally top my hotdogs with the same ol’ thing every time: ketchup and mustard. We eat a lot of hotdogs during the summer months and I was getting a bit bored with them. I decided to change up the toppings just a little and see what else would taste good on a hotdog. Surprisingly, there is a whole other world out there beyond the traditional condiments! 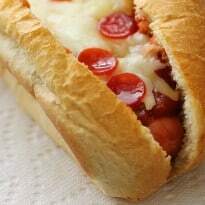 The recipe I made today is a Pizza Hotdog! It’s also really easy to make. Just take a cooked hotdog place it in a buttered bun and top with pizza sauce, cheese and your favourite pizza toppings. I found these mini pepperoni and thought they would be perfect on a hot dog. They fit the bun better than a regular pepperoni slice would. 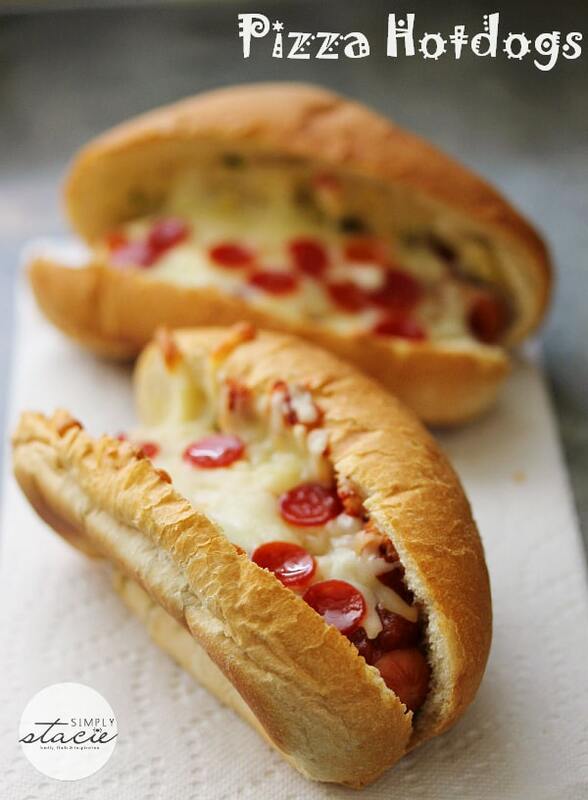 These Pizza Hotdogs were a hit! My kids love them and they are also very filling- much more so than a regular hot dog is. What are your favourite hotdog toppings? For more hotdog recipes, check out my friend’s recipes for Crunchy Bacon Cheese Hot Dogs, Octopus Hot Dog Lunch For Kids, The Ultimate Breakfast Hotdog and Thai Inspired Hot Dogs. A fun and delicious way to dress up a hot dog. My kids love them! Spread garlic butter on both sides of the inside of the hotdog buns. Place a hot dog in each bun and top with a few tbsp of pizza sauce. Place in a 375°F oven for 5 to 10 minutes or until cheese is melted and bun is toasted. oh my goodness that does look AMAZING!! Pinned! Thank you. Pingback: The Ultimate Breakfast Hotdog - Frugal Mom Eh! Oh my! All that cheesy goodness, these look delish! These look absolutely delicious and would be a huge hit for my boys. Thank you for sharing. They look great, even though I’m not a fan of hotdogs I would make mine without and it would still be great. Thanks for sharing! These look really good and definitely a different way to dress up a hot dog! Thanks for the recipe! These look amazing! My boys would think they were in heaven if pizza and hot dogs were combined! Yum! These look like delicious hot dogs! Cute idea and so easy to customize for each person individually. My husband could easy put on just sausage and pepperoni while I could throw on peppers and onions and my daughter could go very light on the cheese. A winner for all! These look so good, I would love to gobble these ones up, but my diet wouldn’t like it..lol my hubby doesn’t like cheese but I sure do, to heck with the diet and my hubby, I’m going to make these!!! These look easy and tasty! Will be trying them soon! This is a great idea for the kids and it makes them so much more nutritious for them too.They look very appetizing and delicious looking. This looks delicious. I bet the kids love these, your mixing two foods that they love. Thank you for sharing this recipe. These look fun I can’t wait to try them. This combines two of my little ones favorite things…hotdogs and pizza! You can’t go wrong. Anything with cheese is delicious in my books 🙂 I bet my daughter and Husband would love it..Thanks for the great idea.. This seems like a great way to make a nice summer change! Something quick, easy and delicious! These are interesting and never thought about doing this. I bet my daughter would love these! The mini-pepperonis are so cute! My kids would love this recipe! They look so delicious and yet sound so easy to make. I’ve got to try this! This looks amazing! Thank you for sharing your recipe with us. Wow my dad and brother would drool over this. Great idea! 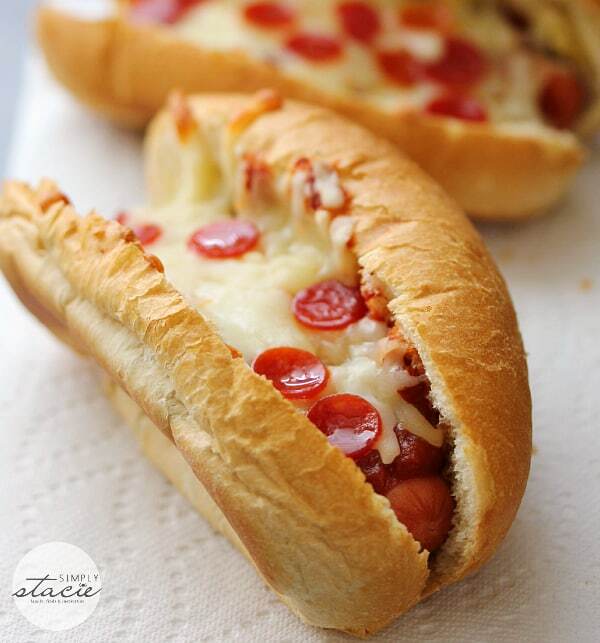 I never thought about making pizza hotdogs! what a great idea. I am going to try making some pizza hotdogs. OMG! I cant wait to try these they look so yummy! Thanks for sharing I will be trying this as soon as I can get to the store. 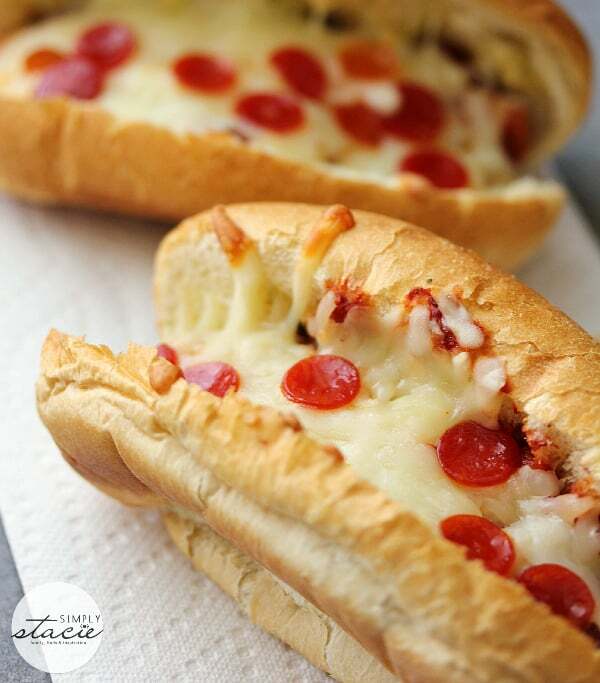 Pizza Hotdog… I did a double and triple take of the pictures. Looks delicious! An absolutely brilliant idea! We love hot dogs so this is taking hot dogs to another level! Pingback: 17 Sizzle Worthy Hot Dog Recipes - Frugal Mom Eh! These look like a fun and delicious lunch. I have pinned this recipe! Thanks for sharing! Great recipe! On a recent trip to Dayton, Ohio, I had a Pizza Dog at Zombie Dogs. Now that I’m back home, thousands of miles away, I’m ready for another! Thanks for unveiling their secret – or at least the secrets of a pizza hot dog. And now I have an even better reason to make some fresh hot dog buns! When I was growing up there was a place that sold pizza hot dogs and this reminds me of that. So yummy!